We call God, a Father. What is a father, fatherhood? Yes, a father brings his children into the world, but this is merely a biological function. The real meaning of fatherhood is derived from the relationship existing between father and child. He fiercely protects and stands by his offspring. 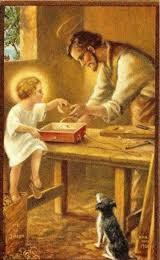 He works diligently, in so many ways, so that his children will have food, clothing and a roof over their head. He is attentive to his children’s needs and is always nearby to assist them. All of this flows out of his love for that which he brought into the world and for whom he has responsibility. “Look at the birds in the sky. They do not sow or reap or gather into barns; yet your heavenly Father feeds them. Are you not worth much more than they are? Our Father in Heaven, He is always with us, always caring for us, what a wonderful realization to have. We know He is watching over us, and is attentive to our needs. Why then, do we worry so? Were we worried as children, when we crossed a street, while holding our father’s hand? When we were awakened at night by a strange noise, weren’t we comforted because our father was nearby? To whom did we go when we had a problem, that we were afraid to tell mom? Wasn’t it dad? Why do we concern ourselves about our security, our health, our stature, our complexion? All of these fade into insignificance when we realize that God, our Father, is with us, is looking out for us. Have we forgotten that God IS nearby? Have we overlooked the fact that He loves us more than we can possibly imagine? Or, do we know He is near us, but don’t trust Him? We don’t trust that we will like, or agree with, His determination of what is best for us. Maybe we are afraid that once we give up our will and accept what He thinks is best for us, we will never be happy again.